With oil prices near their lowest level since 2003, many investors don't know how to find the best oil stocks to buy in 2016. After all, last year's crash in oil prices dragged many high-volume oil stocks down to multiyear lows. WTI crude oil prices plunged 38.8% in 2015 and currently trade at $32.49 – their lowest level in more than 12 years. That caused Big Oil stocks like Exxon Mobil Corp. (NYSE: XOM) and Chevron Corp. (NYSE: CVX) to fall 15.7% and 19.8% last year. Not to mention both companies lost more than $21.8 billion and $9.8 billion in market cap in just December alone. 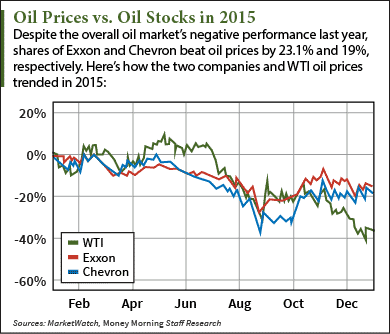 The best oil stocks will profit from the inevitable rebound in oil prices. According to Money Morning Global Energy Strategist Dr. Kent Moors, 2016 oil prices will see big gains thanks to two ongoing trends – decreasing U.S. production and increasing mergers and acquisitions (M&A). You see, the average oil well produces most of its volume within the first 18 months it is online. The majority of U.S. oil wells are now starting to see a drop off in production. That makes sense considering the oil price crash has been going on for over 18 months now. Recent supply reports already reflect the decline. The U.S. Energy Information Administration (EIA) reported monthly production fell from 291.6 million barrels in August to 289.7 million in October. While supply levels continue to fall, demand will rise at a confident pace. According to the International Energy Agency (IEA), global demand will hit 95.6 million barrels a day in 2016. That's up 1.5% from the projected average of 94.2 million barrels by the end of 2015. "The fundamentals paint a picture of tightening oil supply at a time of increasing demand," Moors said back in September. But the most important reason why oil stocks will recover in 2016 is the wave of M&A washing over the energy sector. The current $30 price range will accelerate mergers and acquisitions among oil companies. That's because weak oil prices make production more unattractive for small companies with thin margins since the revenue doesn't outweigh expensive drilling projects. Bloomberg analysts forecast that oil and gas companies cut their capital spending by 21% last year and will continue to do so until prices stabilize. For smaller producers struggling to conserve cash, being acquired may be their only option. "The specific objective of M&A may vary from deal to deal, but the overall goal remains the same: to streamline participation in advance of sector stabilization and the inevitable rise in raw material prices," Moors said on Sept. 16. Oil M&A activity started off strong last year and will continue this year. According to PricewaterhouseCoopers, there were 98 oil deals accounting for $130 billion during the second and third quarters of 2015. About $80.8 billion of the cash generated came from just seven deals alone. On April 8, Royal Dutch Shell Plc. (NYSE ADR: RDS.A) bought BG Group Plc. (OTCMKTS ADR: BRGYY) for $81 billion. The merger became the third-largest deal in the world last year and will create the single largest independent producer of oil and natural gas. Once the deal finalizes this year, the new company's market value will double that of BP Plc. (NYSE ADR: BP) and be larger than that of Chevron. But M&A won't turn every company into the best oil stock to buy in 2016 overnight. That's because oil prices will need to bottom out before moving higher. In other words, prices will get worse before they get better. Although they will climb in 2016, they still won't reach the triple-digit levels they saw in 2014. The best oil stocks to buy in 2016 will be companies engaging in "VSF drilling." "VSF" refers to vertical, shallow, formula drilling. This is when a company drills wells that are only a few thousand feet deep in order to quickly produce a large amount of volume. VSF wells are most likely to turn a profit during low price environments since they only cost $600,000 or less from start to finish. Since deep fracking projects can cost upwards of $5 million, they can drown companies in debt when oil prices are low. That's because high production volumes don't offset high operating costs when prices are near their current $35 levels. "The extension of vertical, shallow pattern drilling emphasizing known basins and low-cost operations will actually be encouraged in this kind of climate," Moors said in February, when WTI sank below $60 for the first time since the Great Recession. "This is always the way money is made when oil and gas come under pressure." One company pursuing VSF drilling projects this year is Crescent Point Energy Corp. (NYSE: CPG). On Jan. 7, the Canadian oil firm announced it will drill vertical, shallow wells in Canada's Saskatchewan province as part of its capital expenditure plans for 2016. "The high-quality, shallow nature of the company's Saskatchewan plays provides the opportunity to outperform with lower cost and higher recovery factors relative to other plays in North America," CNN reported after Crescent Point released its spending details. The Bottom Line: With oil prices sinking below $33 this month, investors are wondering if beaten-down oil stocks will recover in 2016. The current pressure on the oil market presents the perfect opportunity to invest in oil companies for cheap – but don't just add any oil stock to your portfolio. The best oil stocks to buy in 2016 will be the companies focusing on vertical, shallow, and cost-efficient drilling operations. "Recent supply reports already reflect the decline. The U.S. Energy Information Administration (EIA) reported monthly production fell from 291.6 million barrels a day in August to 289.7 million in October." Don't you have the decimal point in the wrong location? Believe correct production numbers are 29.16 and 28.97 million barrels per day. Actually those are monthly numbers. We've fixed it in the story. Thanks for the heads-up!